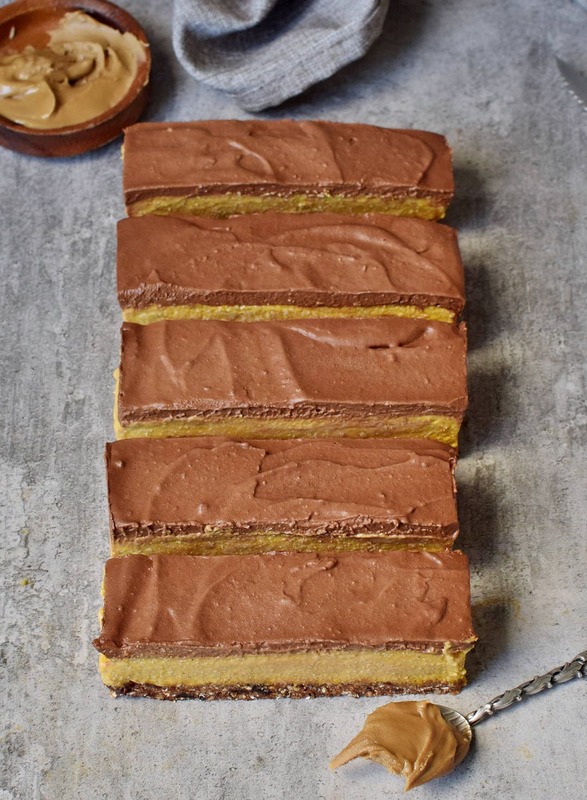 I hope you don’t mind me sharing another sweet pumpkin recipe, but in my opinion, you can never have enough pumpkin desserts in your life, especially during fall, right? 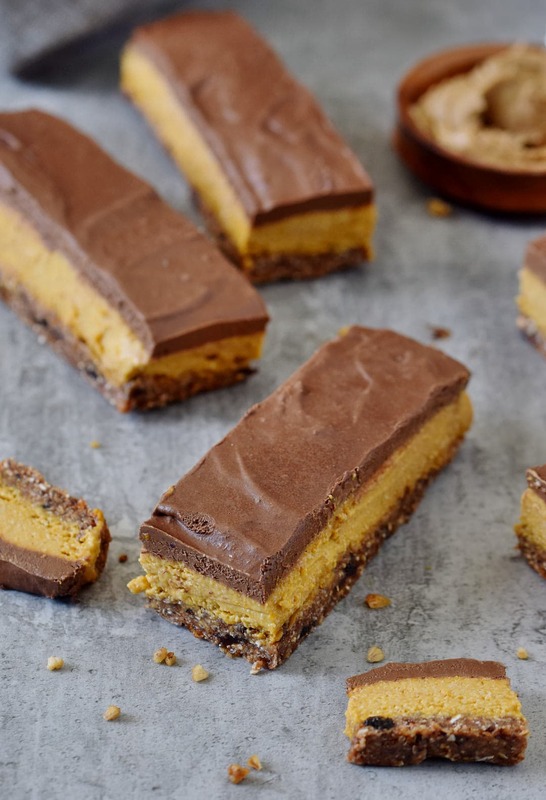 Furthermore, these no bake pumpkin bars don’t need to be baked (obviously! 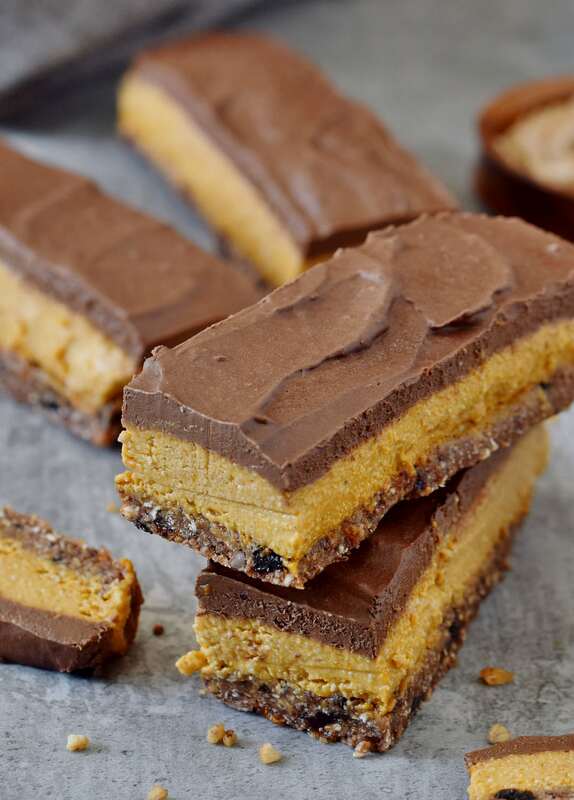 ), they are healthy and ridiculously easy to make, that everyone can make them, like seriously EVERYONE, no baking skills are required, I promise! “I prefer no-bake recipes. You can taste things as you go and know that it will taste like that once finished, whereas when you bake, you just gotta hope for the best! It might taste funny or be dry once cooked… No-baking is much better“! So if you are afraid of baking, and want a pumpkin dessert, definitely try this one. I made it three times already and it always came out great. These bars are made of whole foods only. I even made the pumpkin puree myself, which is super easy to make btw., as you just need to bake pumpkin in the oven and then blend it in your food processor or blender (however, you can use store-bought canned pumpkin puree). These healthy no bake pumpkin bars contain no gluten, no eggs, no dairy, no butter, and no refined sugar. Whipping up the chocolate glaze takes about three minutes, but you can leave it out if you don’t like chocolate (though I never met a person who doesn’t like chocolate, did you?). The chocolate glaze is more like a chocolate spread (think vegan Nutella) rather than “real chocolate”. If you want a real chocolate layer and don’t mind the extra fat and calories either, add a few tbsp melted cocoa butter or coconut oil to my chocolate glaze recipe. However, you could also simply melt store-bought dairy-free chocolate chips in a double boiler and pour the melted chocolate over the pumpkin filling. If you prefer a creamy cashew frosting, then check out my VEGAN PUMPKIN CAKE and if you want a fat-free and low-calorie sweet icing, then you definitely have to check out my VEGAN GLUTEN-FREE CARROT CAKE. I hope I didn’t confuse you now… If I did I am sorry, I just wanted to give you different options, hehe. You can leave out the oat flour and use almond flour or coconut flour instead (check the Recipe Notes for more information). If you don’t want to (or can’t eat) nuts, then use sunflower seeds or pumpkin seeds for the crust. 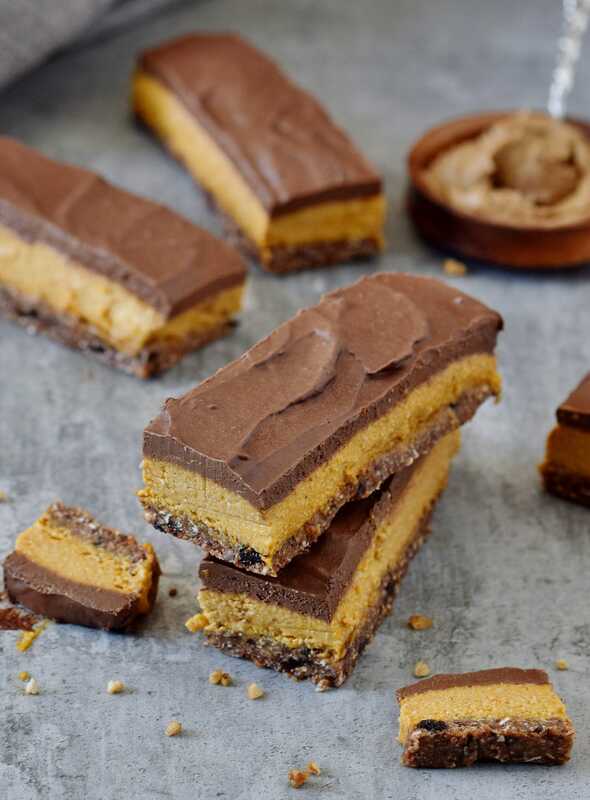 I made these no bake pumpkin bars with sunflower seed butter, which I love, but you can use almond butter, peanut butter, cashew butter or any other nut/seed butter instead. 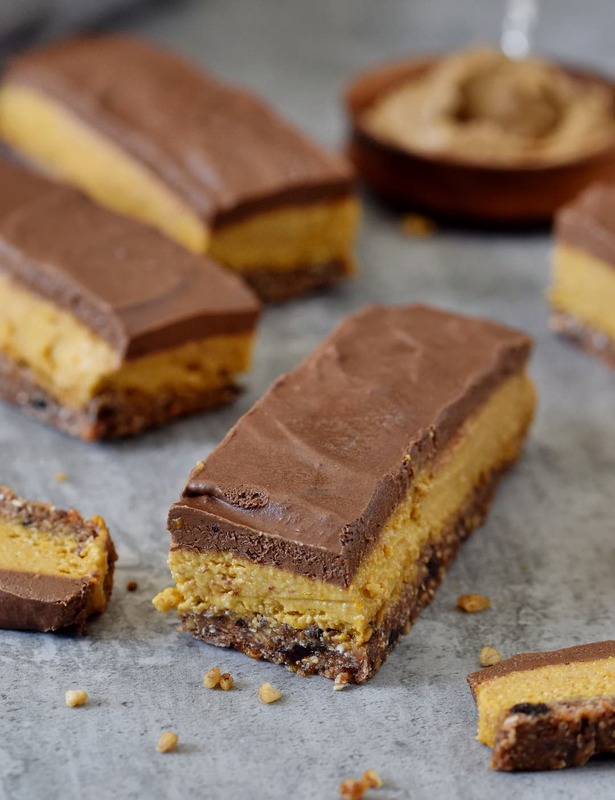 Please leave a comment below if you make these healthy no bake pumpkin bars. You can also make a photo of it and post it on Instagram (or send me a DM). If you tag me in the caption + photo with @elavegan and use the hashtag #elavegan I will check out your post and leave a comment. Happy UNbaking! 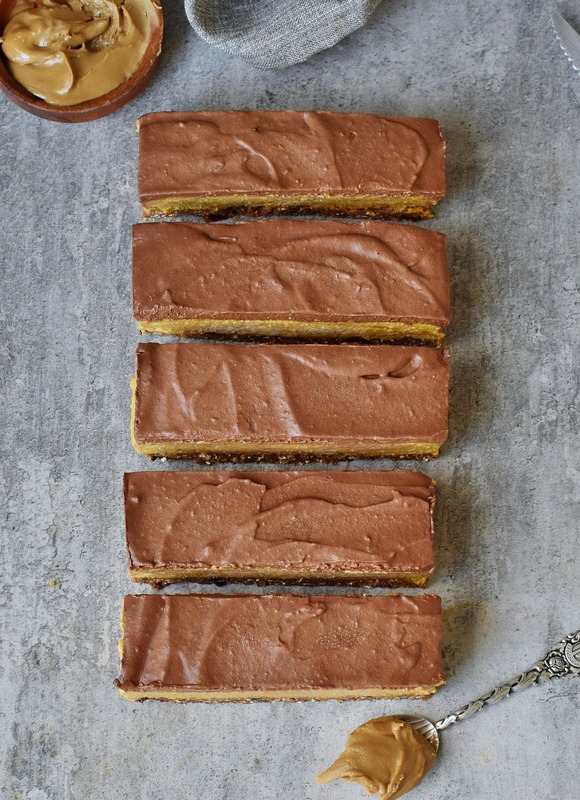 Healthy no bake pumpkin bars which are vegan, gluten-free, paleo-friendly, refined sugar-free and very easy to make. No baking skills required! **You could use almond flour instead of oat flour for a paleo version. If you want to use coconut flour I would suggest using just half of a cup (or even less), because coconut flour is very absorbent. 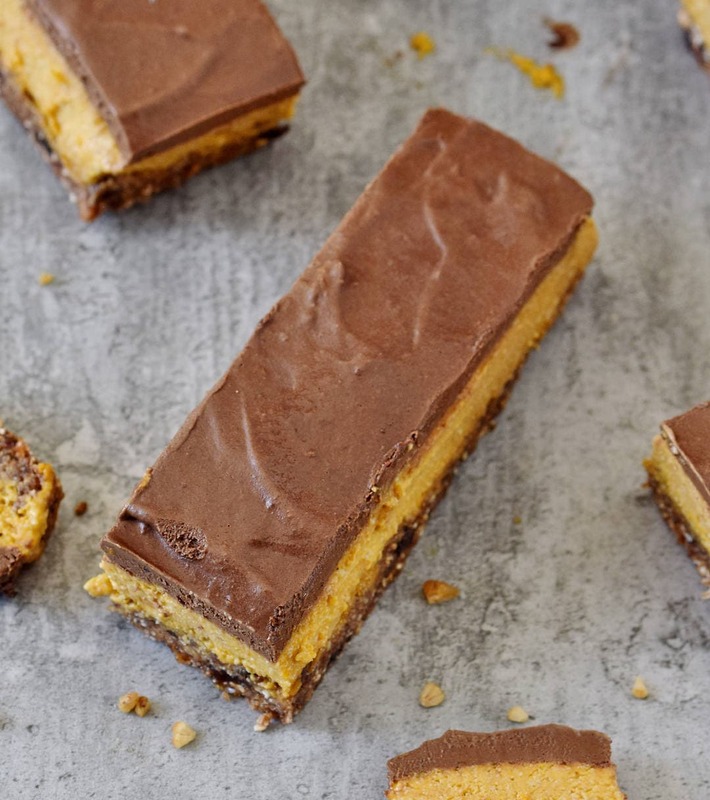 The Nutrition Facts are for one bar if you cut the batch into 12 square bars. Calculation includes the chocolate glaze. Ich habe sie direkt nachgedacht und war echt überrascht wie schnell und einfach es ging. Sie schmecken unfassbar gut ! Alleine beim probieren der gelben Masse wusste ich, dass ich sie auf jeden Fall noch mal machen werde!! Danke für das tolle Rezept! Keep the pumpkin recipes coming! These bars look amazing Ela 😀 Love those layers and they’re so easy to make! I’m just sad I can’t reach out and grab one right now! These layers are so amazing, Ela! And the ingredients are so fun, healthy and creative! I especially love the use of mulberries and the fact that you made your own pumpkin puree! Makes this dessert all the better! Well my friend, you’ve done it again! This is outstanding looking creation, and these layers are making me salivate! Such an incredible work Ela, as always! Anything you could replace the oats with?! Ideally a grain free option?! 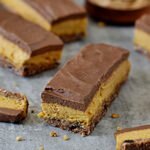 This recipe is definitely one of the best no-bake desserts I’ve ever tried! It was so easy to make, and the taste of each layer is just perfect. I am addicted – thank you, Ela! I LOVE THIS … AND I LOVE YOUR BLOG! IT’S SO NEAT, WELL DESIGNED AND FILLED WITH GREAT RECIPES. I’M A CHOCOLATE AND PUMPKIN FAN, SO I DEFINITELY HAVE TO TRY THIS! THANK YOU FOR SHARING THIS RECIPE IN SUCH A CLEAR, PRETTY AND ORGANIZED WAY. I WILL VISIT THIS BLOG REGULARLY!